“Prof. Yuan Yang of the engineering school at Columbia University (New York) modeled, designed, built, and fully evaluated a configuration that emulates the spine of vertebrates, while providing 85% of the energy density of a prismatic Li-ion cell with equivalent volume.” According to Power Electronics.com. Professor Yang’s 14-member team, working in the impressively-named Center for Precision Assembly of Superstratic and Superatomic Solids, and inspired by the flexibility of the human spine and its ability to repeatedly endure bending and twisting, designed a battery that emulates the characteristics of what is in essence a structural battery. We know from experience that our backbones can perform some pretty extraordinary twists and turns – witness the supple routines of gymnasts and Cirque de Soleil performers. Our spines are not rigid assemblies, but a complex construction of solid parts (vertebrae), flexible bits between the vertebrae (disks), and a network of wiring (nerves), which transmit signals from our organs and extremities to the brain and back. The electrolytes carried in our blood and circulated throughout our body help power the constant brain/body interactions. This pitifully lay version of things can give only a hint of what really goes on in this marvelously complex system. 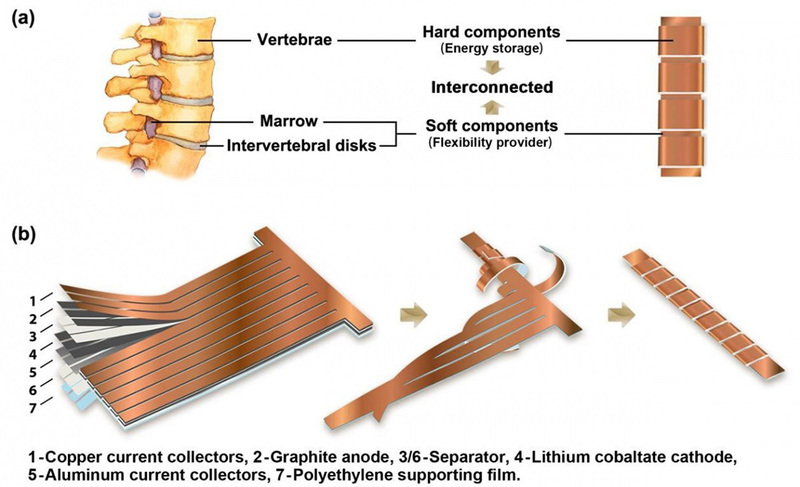 Sufficient similarities between what happens in our bodies and what transpires in batteries led research Yang to devise a battery that allows the flexibility of the spine with a resilience that seems surprising, given the explosive characteristics of conventional lithium batteries. YouTube abounds in videos of batteries being subjected to various forms of bending and poking, with fiery results. Yang’s YouTube evidence shows his batteries undergoing repeated flexing at high speed without crying “Uncle!” as our own spines might. This durability would be of great use in wearable electronics, and might have a place in grander mobile structures. To verify mechanical integrity, researchers cut open the post-test battery and found “no obvious cracking or peeling from the aluminum foil, confirming the mechanical stability of the design. Even better, flexing seems to have caused no changes in the voltage profile during the entire discharge cycle of the battery. The team’s paper, “Bioinspired, Spine-Like, Flexible, Rechargeable Lithium-Ion Batteries with High Energy Density,” was published in the January 2018 issue of Advanced Materials. Although the paper is a pay-per-view item, 12 pages of supporting illustrations and the two videos shown here are not. Flexible and Strong Enough for Aircraft? 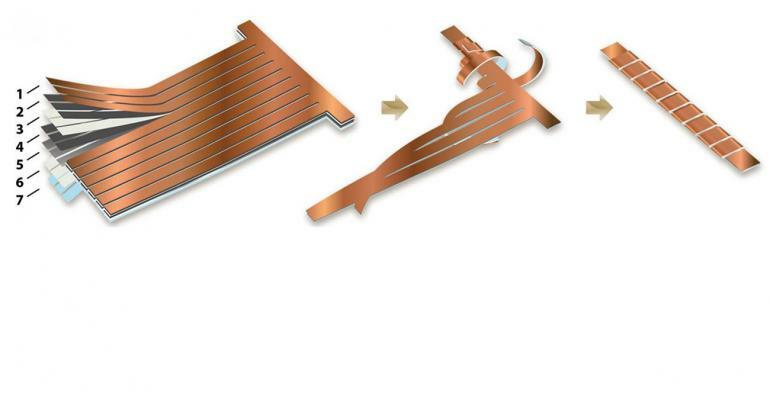 If this material will work for watch and FitBit bands, or provide heat for skier’s parkas, would it not be a candidate for use in future aircraft structures? Your editor has been an advocate for what he calls the Grand Unified Airplane, a vehicle that would pull energy from the air and sunlight through which it flies. This type of battery could provide energy storage and structure in an all-in-one component – or even a complete airframe. Thanks to Patrick McLaughlin for sharing the source material for this entry.